YouTube updated once again its embeddable player to match the one currently available in beta at YouTube.com and the custom players. There aren't two many changes, but the player is snappier and looks better. 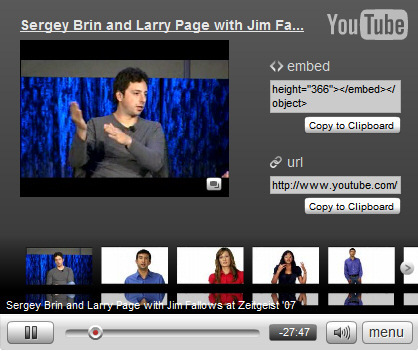 If click on "more", you'll see two ways to share the video: by embedding it in your site or by sending the link. The embedding option generates a player with a bigger height than usual, which suggests the new player could be ad-enabled like the recently launched video units. In an interview, Marissa Mayer admitted that YouTube's embedded player is a very valuable asset and makes YouTube a distribution platform. YouTube became so popular that many people who want to post a video online or share it with their friend go to YouTube and upload the video. This way, almost any important video from the recent years can be found on YouTube. Because of its omnipresence, the YouTube player is a great vehicle for advertising and Google intends to use it: YouTube introduced overlayed video ads for some content partners, an AdSense-enabled YouTube player, but the new video identification technology launched this week will allow them to extend the monetization to the rest of the videos. 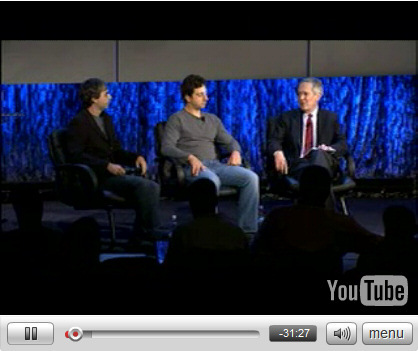 Here are two screenshots of the updated player, followed by a discussion with Sergey Brin and Larry Page from the Google Zeitgeist 2007 conference. Looks good, though the buffering color isn't different enough from the non-buffering, meaning if you switch windows and you go back to the YouTube video it will be hard to tell if the buffering finished or if it's at the position of the currently played part. Minor point though. Youtube changes its player quite often. Nice upgrade.